Location: Tyrrhenian Sea, Mediterranean. 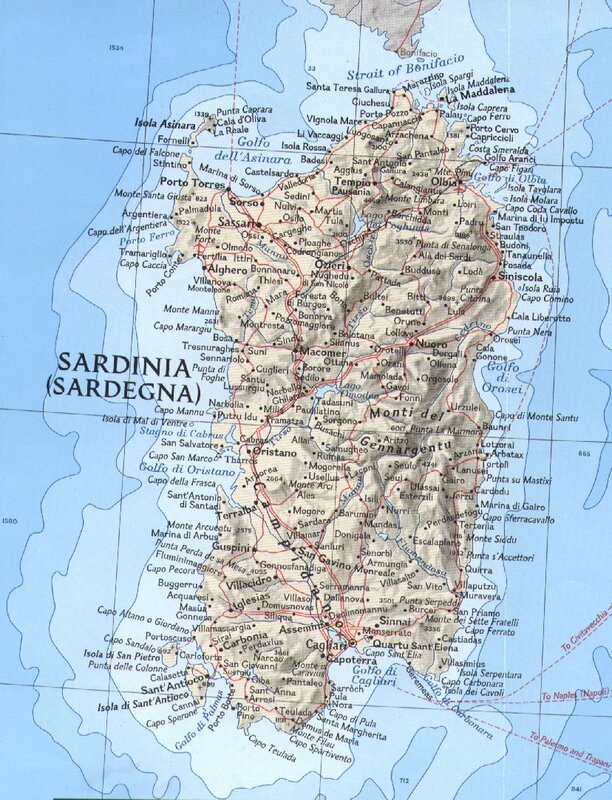 Grid Reference: Approx centre: 40° N, 9° E.
Sardinia is currently an autonomous region of Italy and the second largest island in the Mediterranean after Sicily. 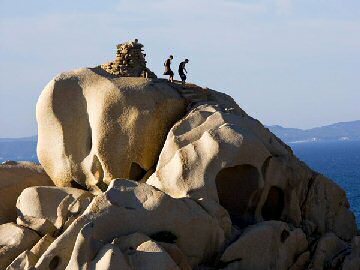 Although there is evidence of human occupation from the Palaeolithic, the island was only permanently settled from around 6,000 BC in the early Neolithic, (1) probably from Corsica, or the continent via Corsica. 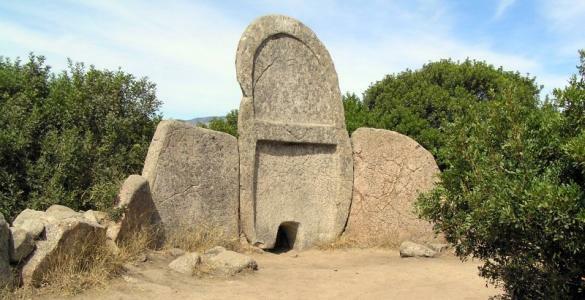 There are several distinct forms of Sardinian monuments that dominate the prehistoric landscape: The Nuraghi, Domus de Janas and the Tombes Gigantes. 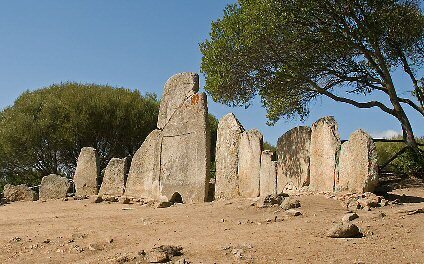 The Tombs of Giants, so called because of their gigantic dimensions, are another typical element of Sardinia's megalithic period. Usually the frontal part of their structure is delimited by some sort of semicircle (exedra), almost as to symbolize a bull's horns (Many Tombs of Giants are also oriented towards the Taurus' constellation, precisely towards the brightest star, Aldebaran (Alpha Tauri). 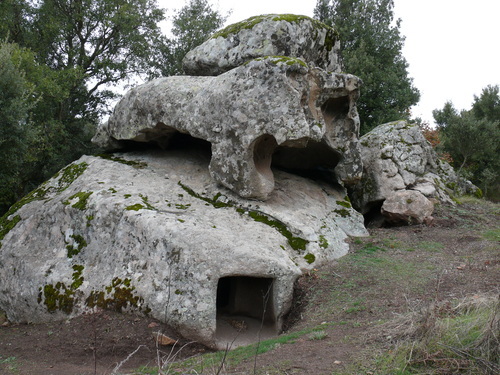 This is the case of the Tombs of “S'Ena e Tomes” in Dorgali, “Goronna” in Paulilatino and “Baddu Pirastru” in Thiesi (5). 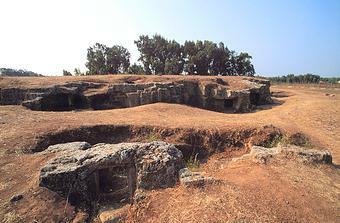 Viewed from above the shape of the Tombs of Giants has also been said to mind that of an uterus or a woman in labour. This interpretation confirms how closely connected life and death were for nuraghic people and how their structures were linked to the cult of fecundation. The Tombs of Giants are scattered throughout the island. So far about 320 have been found, but it is thought that Sardinia may still be hiding many more of them. 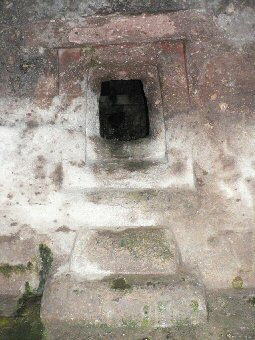 Tomba di Dorgali, showing closely carved stones at the entrance and a small portal at the bottom which was carved with what is interpreted as a representation of a 'false door leading into the other world of the dead'. 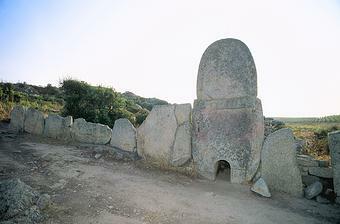 (left) Coddu Veccio, and (right) Li Goghi, two of the largest Tombs on Sardinia. 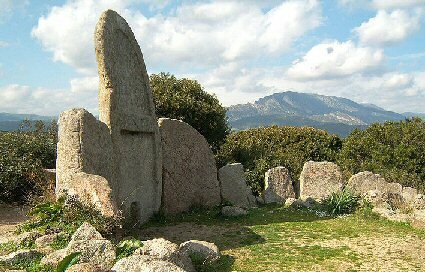 The Giants Tomb of Olbia (1500 to 1100 BC). The central stone has been removed revealing the main structure which lies behind it, which can only be described as an Alèe Couverte. The monuments are the result of at least two stages of development; the first being the construction of an internal megalithic burial chamber, and the second being the external forecourt, believed to be for congregations, a similar design as seen in front of the temples on Malta. Domus de Janas: 'Spirit Houses' or 'Faerie houses'. 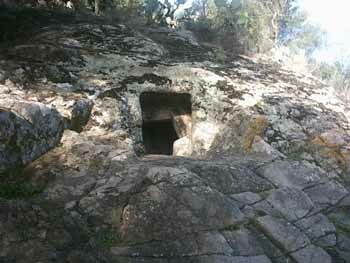 Especially interesting are the tombs known as domus de janas (Spirit homes). They were built by hollowing out large rocks to form a funeral chamber within, leaving the natural rock surface to serve as the outer wall. This one above is on the site of the S'Ortale e Su Monte/San Salvatore complex near Tortolì on the south-eastern coast of the island. Two more examples of the aptly named 'Fairy houses'. 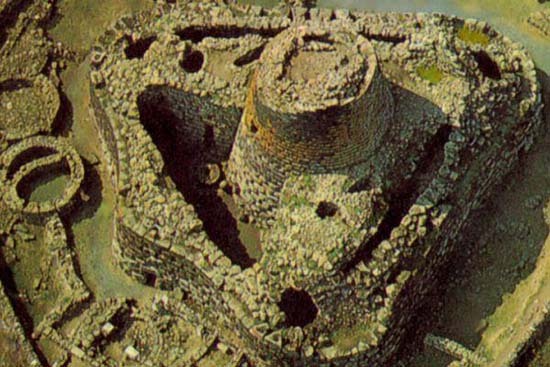 This natural trachyte monolith near Castelsardo has long held an emblematic presence in the region as there are several pre-nuraghic domus de Janus carved within its structure. 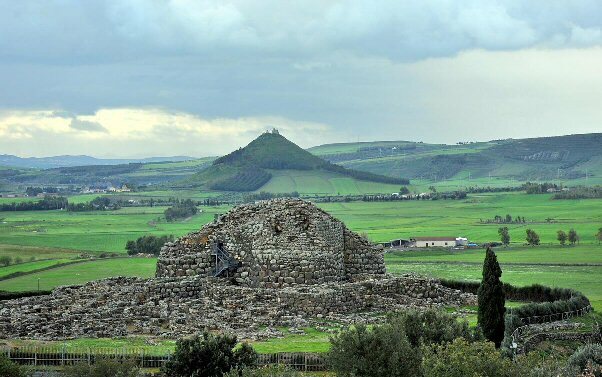 It is believed to have long been a significant site as it is located next to the monument known as 'Multeddu', within which was found an inscription reminiscent of a temple dedicated to the Goddess Isis, and a statuette to the goddess Ceres (Now in the Museo Sanna in Sassari). 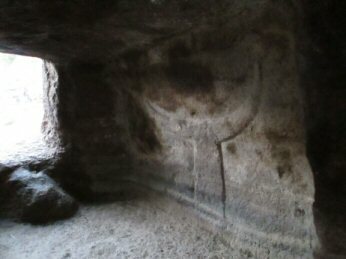 The chambers are carved with doorways, with relief frames similar to the chambers of Anghelu Ruju (below), along with two large curling bull-horns in one of the chambers. 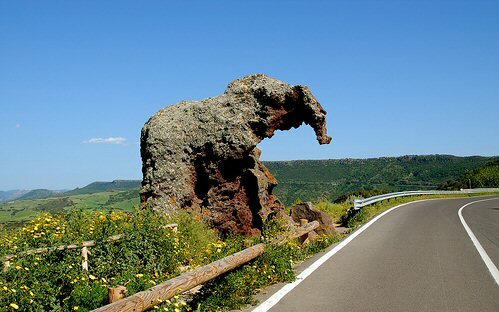 It is of course interesting to note that the similarity to an elephant was presumably recognised over 5,000 years ago, suggesting that the people who carved it and built the Multeddu next to it must have already known what an elephant looked like and were therefore likely to have been regular travellers around the Mediterranean (i.e. having already been to Africa). 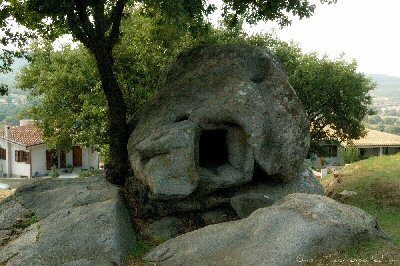 The Necropole di Anghelu Ruju is the largest ancient burial ground on Sardinia and dates from 3,500-1,800 BC. 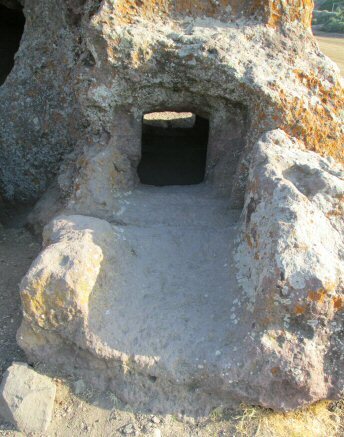 The thirty-six tombs are cut from or made of sandstone, sharing some common design features: a series of steps down from the entrance and a descending passage to a large burial chamber with smaller connecting chambers. Many of the 36 tombs have doorways carved to simulate trilithons. 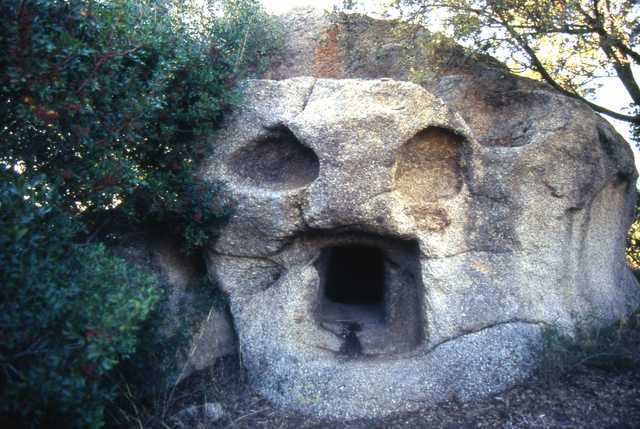 (A feature with stark similarities to those seen in the Hypogeum, on Malta). Many of the doorways are carved to imitate smoothly dressed trilithons, but what makes Anghelu Ruju famous are the carvings of long-horned bulls' heads in and around three of the tombs (numbered 19, 20 and 30). These symbols were sometimes painted in red ochre, and they have been interpreted in different ways. It is worth noting that many of the human bones found in the tombs were lying under a sheet of white shells; this could indicate that most of the ancient Sardinians buried here were fishermen. Among the many grave goods dating from 2200 to 1700 BC found at Anghelu Ruju, there are obsidian, barbed and flint arrowheads, an axe and an awl from Ireland, a copper ring from East Europe, copper daggers from Spain, Beaker pottery, small marble statuettes, and spiral wire beads. Something which attests to the strong and extensive trading in operation at that time. Carved Portals at (Left) Tomba di Santu Pedru, (Right) Anghelu Ruju. They had various rooms and floors, corridors, cells, internal staircases, even parapets, for they were true miniature castles, built to dominate the surrounding countryside. 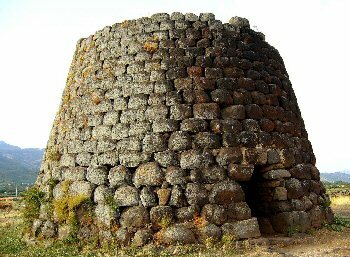 Architecturally, there are similarities to structures of the ancient Mycenaean civilization on Crete, such as the 'Tholos' - beehive shaped internal chambers, leading some scholars to believe that these original Sardinian stonemasons came from that part of the Mediterranean. The remains of dozens of these nuraghi are still found throughout the island, primarily in the north. 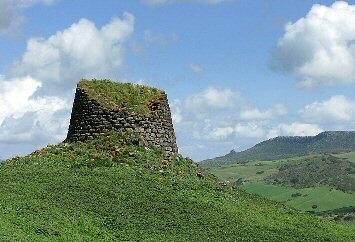 The nuraghi at Barumini is the largest on Sardinia and is located in the southern part of the island roughly between Oristano and Caglieri. When it was first rediscovered it was covered in soil and mistaken for a hill. There is no absolute consensus on the function of the nuraghi: speculation ranges from religious temples, ordinary dwellings, rulers' residences, military strongholds, meeting halls, or a combination of the former. Some of the nuraghes are, however, located in strategic locations – such as hills – from which important passages could be easily controlled. They might have been something between a "status symbol" and a "passive defence" building, meant to be a deterrent for possible enemies. It has been noticed that they are often inter-visible, and where they are not, smaller intermediate versions were built, suggesting continuity for signalling. Examples of early or 'simplified' Nuraghi. 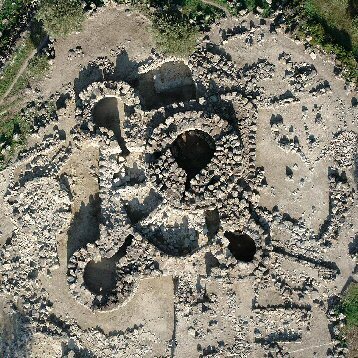 Small-scale models of nuraghe have often been excavated at religious sites (e.g. 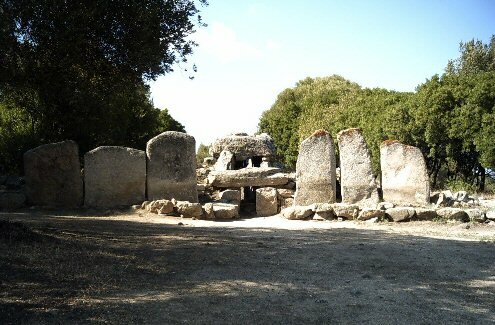 in the "maze" temple at the Su Romanzesu site near Bitti in central Sardinia). Nuraghi were often located next to temples, specifically water temples. (This theme is expanded on below). 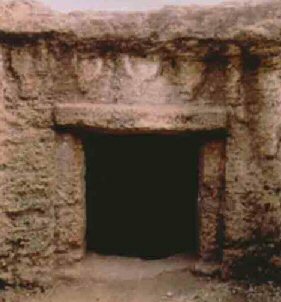 The work of Juan Belmonte and Mauro Zedda has studied 272 simple and 180 complex nuraghi; they noted that the orientation of the door was always turned towards the south-east, where the sun was known to rise. Indeed, they argue that several of the windows in the nuraghi have solar, lunar and/or stellar alignments. 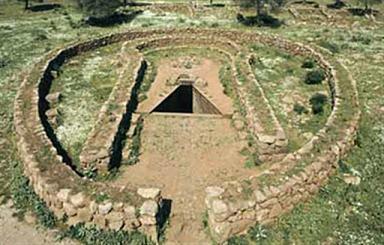 One such astronomical phenomenon was observed in the Nuraghe Aiga di Abbasanta. Here, the summer solstice sun entered into the construction itself and creates an impressive solar display. Such solar alignments argue strongly for a religious function, if only partial, as such alignments clearly have no defensive qualities. Examples of more complex Nuraghi. In the Bronze age two dramatic events took place that had their repercussions on the east and the west Mediterranean, including Sardinia. The first event was the decline of the palace culture of the Minoan period on Crete and the rise of the Mycenaean's, between 1500 and 1400 BC. The second event was the time of the incursions of the Sea People in Egypt and the decline of the Mycenaean palace culture, around 1200 BC. 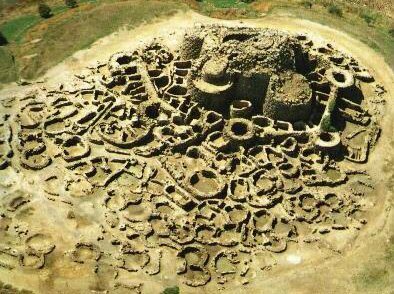 It was around 1200 BC that on Sardinia complex nuraghi were built, an amplification of a central nuraghe with one or more additional towers, a small courtyard and even additional defensive walls and minor towers. Lilliu has called this period La bella età dei nuraghi, the climax of the nuraghe-culture. 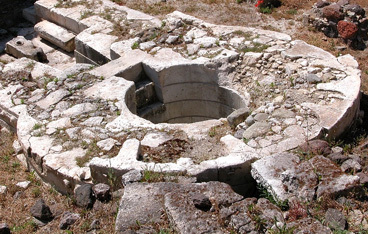 The nuragic well is another important element of the Sardinian megalithic heritage. 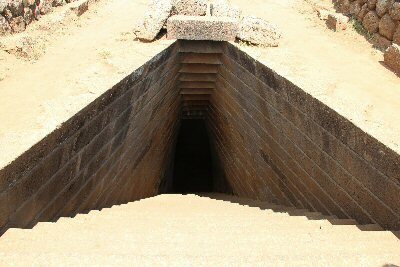 At the moment we have around 40 wells reachable thanks to a monumental staircase after which there is an atrium (Tholos) for holding the water. 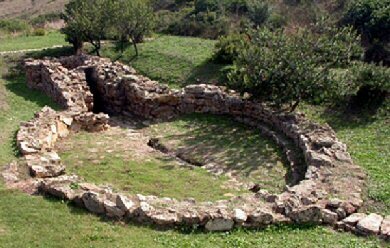 In the case of the sacred well of Santa Cristina in Paulilatino-Oristano, it has been assessed that thanks to the hole situated on the tholos vault, the moon is reflected on the well. This happens during a predefined period, that is to say at the utmost declination of the moon, every 18 years and 6 months. Thanks to the staircase, the sun’s light is reflected in the well during the autumn equinox (between the 22nd and the 23rd of September) and also during the spring equinox (between the 20th and the 21st of March). The moon’s peculiarity has been noticed also in other wells; also the solar reflection is sometimes visible during the summer solstice (between the 20th and the 21st of June). The Santa Christian Sacred well, exquisitely constructed, and orientated to receive the light from the maximum setting moon on its 18.6 year Lunar cycle.